GO! 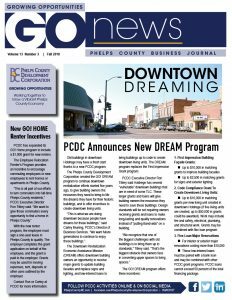 news is a quarterly publication created for the Phelps County Development Corporation. It is mailed to all residents of Phelps County to keep them updated on economic development news. It highlights PCDC programs and incentives and also shares relevant business news, such as new people and businesses. It has become an essential tool to keep the public informed about the important work of PCDC.